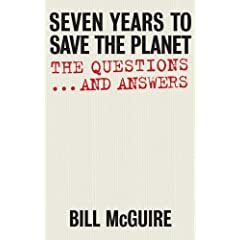 ‘Seven years to save the planet: the questions… and answers’ is the full title of McGuire’s book, and it is essentially a climate change frequently asked questions. Since the whole issue of climate change is basically one big question, that’s a sensible approach – what’s happening? Why, and where? What do we do? McGuire starts with the facts. The earth has warmed by o.74C in the last century. Carbon in the atmosphere has risen to 386 parts per million, from a pre-industrial norm of 280 ppm. Sea levels are rising by 2 millimeters a year. Where there are clear answers, this is great. Are there more floods than there used to be? Yes, there were 100 or so major floods in the 90s, and 250 so far this decade. This is useful information. Where questions are more speculative, like ‘will the Arctic soon be ice free?’, the answers are considerably less useful, and inclined towards a worst case scenario. This tendency suddenly steps up a gear in the second part of the book, where the author attempts to describe the world in the future. It’s bleak indeed, a place where storm lashed mountains are falling into the rising seas, droughts wither the land and disease ravages its people. I raised an eyebrow or two. There’s no evidence, but what the hell, let’s throw it in the predictions anyway? A link between tornadoes and climate change may be found, but until it is, let’s not presume. You might as well predict that a warmer planet will an alien invasion will be more likely. If all the doom and gloom was a little depressing, I should have looked up McGuire’s previous books. His previous works include ‘A guide to the end of the world’, ‘Surviving armageddon’, and ‘Global catastrophes: a short introduction’. Doom and gloom is Bill McGuire’s middle name. The book picks up again in the later sections, discussing both personal actions and wider initiatives for fixing the problem. McGuire even attempts to end on a positive note, but by that time the damage is done and his optimism rings a little hollow. If you’re going to read a number of books on climate change, by all means pick this up. Each answer has a one paragraph summary answer and then a longer one, so the facts will be at your fingertips. Unfortunately it’s not referenced, so you can’t follow anything up, otherwise it would be quite a useful reference. If you’re only going to read one book on climate change, pick something more hopeful!